Like the CRF250L itself, I use longer rides to try out new stuff, new ways of doing things or whatever else catches my imagination. 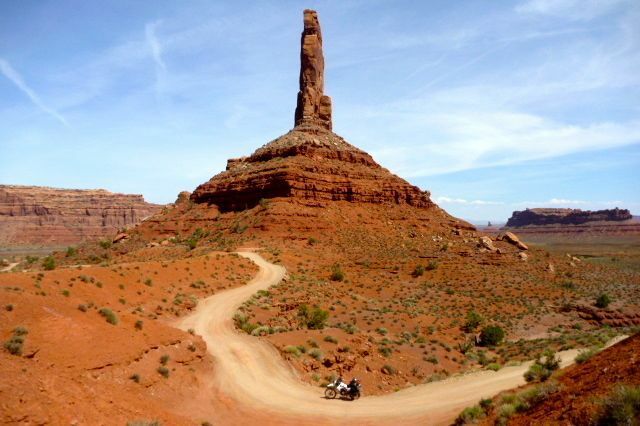 Below is the equipment roll call from the 2013 Honda ride around Southwest USA. What worked, what didn’t and why. The prices given in £ or $ are what I paid for the gear or what it cost. Some items like Kriega, Magadans, Trailtech and Aero stuff has been supplied to me over the years in exchange for adverts in the book. No complains about my Magbags; the best soft bag out there for my sort of riding. 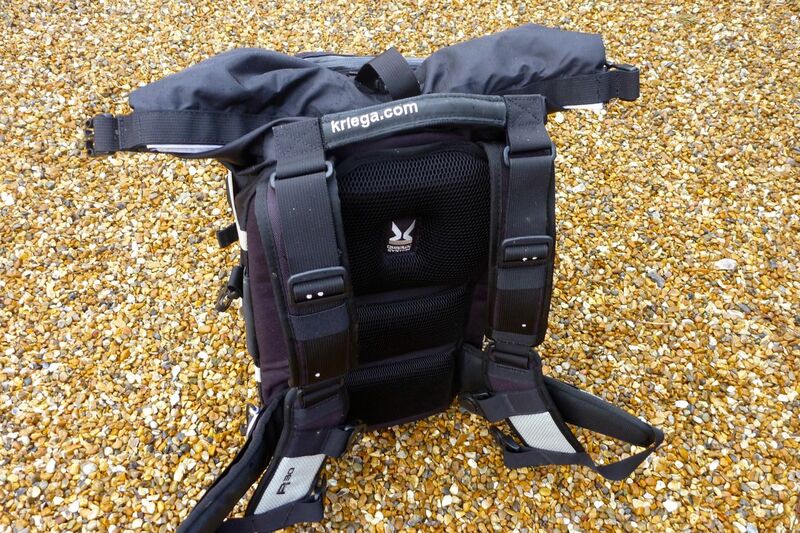 Simple and functional, great capacity, big external pockets and tough fabric. It didn’t rain enough on this trip to test them, but it lashed down on previous UK rides with no leakage, even through the fabric outer, let alone the thick PVC liners. Requires a rack but that’s the way it should be for heavy loads in soft bags. More on the Mags here. Verdict: regret giving these away with the CRF. 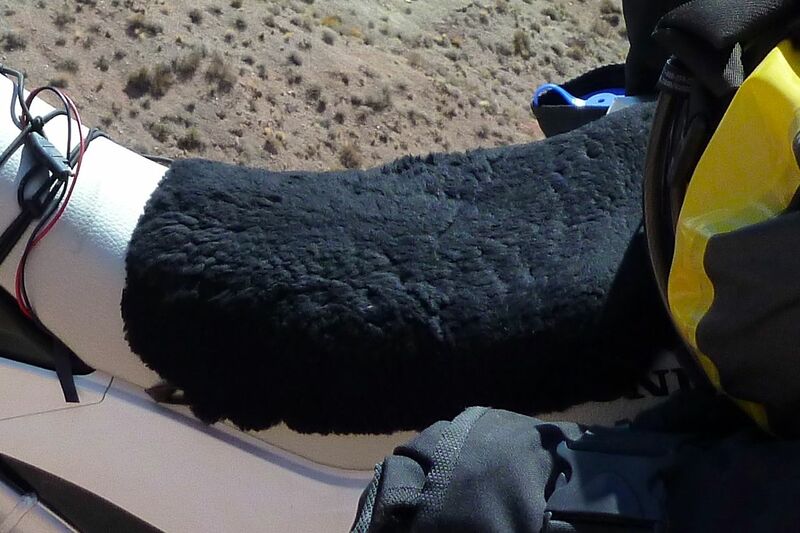 I used this last year in Morocco on a BMW 650 twin which has a seat straight out of Enhanced Interrogation; sadly the Aeropad couldn’t save it – three inches of Moroccan mattress foam did (below). 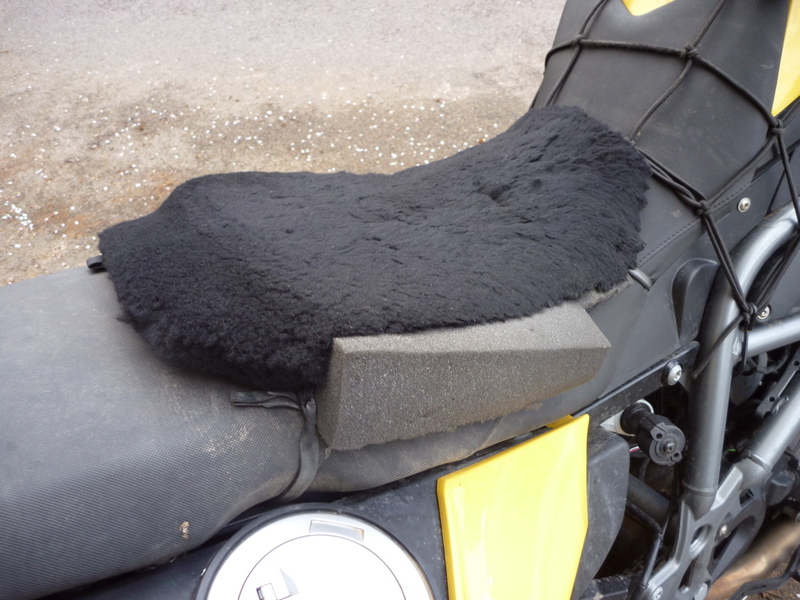 On the Honda the wool pad may have taken the edge off, giving another hour’s comfort but I actually found frequent dismounts were as effective to posterior durability. Another interesting thing: mostly I rode in my leather jeans but one hot day I wore thinner (slipperier?) synthetic 5-11 Tactical trousers (great gear btw, much tougher than ‘outdoor rec’ stuff). Result: sore arse arrived very soon. I also found the wool would pack down and lose its loft after a few long days, but could be easily washed and ruffled up. And after a night in the rain a vigorous rub dispersed most of the moisture. Verdict: seemingly minimal improvement but can’t do any harm. Never heard of Alpha Three – could be Japanese rather than Chinese? – but this ‘Type A’ item was a neat little rack with downward pointing prongs incorporating hexhead bolts to securely attach stuff, should you wish. A tendency has developed towards racks cut out of flat metal sheets, either thick alloy or thin galvanized steel. Reason: cheaper manufacturing costs not necessarily reflected in the retail price as they’re the latest ‘thing’. Smaller ‘plate racks’ the size of the Alpha might be fine but some of the wider ones as tested in Overland Journal (Fall 2012) have nasty thin edges that I wouldn’t want to meet while tumbling down a slope, even though I’m all for wide ‘sheep racks’ in principle. Conventional tube racks are easier to use and grip, when needed. 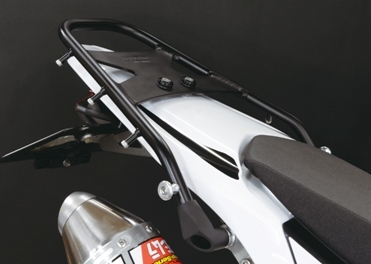 There are a few more CRF-L rack options listed here. Verdict: a slick and well-featured tail rack. Always liked the Aussie-made BBs and even though cheaper versions are available I splashed out at more tolerable US prices US prices on some Barks with the biggest Storm handguards to keep for later. Cheapies often don’t fit so well; the key I believe is the articulated joint (available separately) at the inboard mounting end. Cheaper versions off ebay have no joint – less easy to position optimally. I like to think the Storm handguards kept my hands warmer and drier and so deferred the need for heavy gloves – I always prefer thin unlined gloves. The only time I fell off the Barks did their job, although one drawback with all lever guards is you can’t hang stuff, including a helmet, so easily off the bar ends. I’ve fitted bungy hooks on previous bikes. Verdict: worth paying out and keeping for the next bike. I omitted to note what brand it was – Ricochet is a name that bounces around the forums. Engine protection is a no brainer of course, even if I only dinged it once on the gnarly Lockhart Basin track. 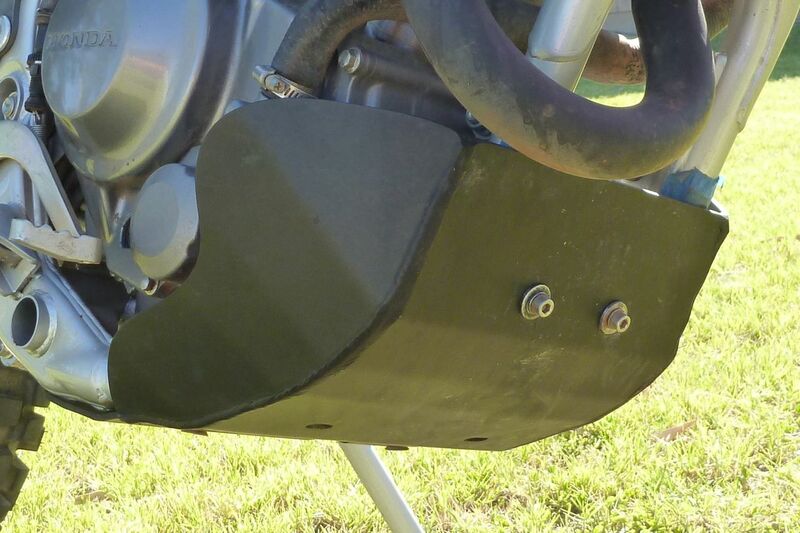 The fit was fine – no exposed bolts on the underside and a hole to enable drain plug access without removal. But clamped directly to the frame rails I found the resonance intrusive. I reduced that by refitting the plate with some strips of closed cell foam (karrimat) on the frame rails. Like others, I also think a bit more width to either side would improve protection of the filter housing and bottom hose. Verdict: As usual, the OE plastic plate is a joke. Essential for off highway riding. Probably discontinued by now but great lid for the money. Full review here. I’ve been using these for years in the US and on this trip they came into their own for riding off pavement across Nevada and Utah. 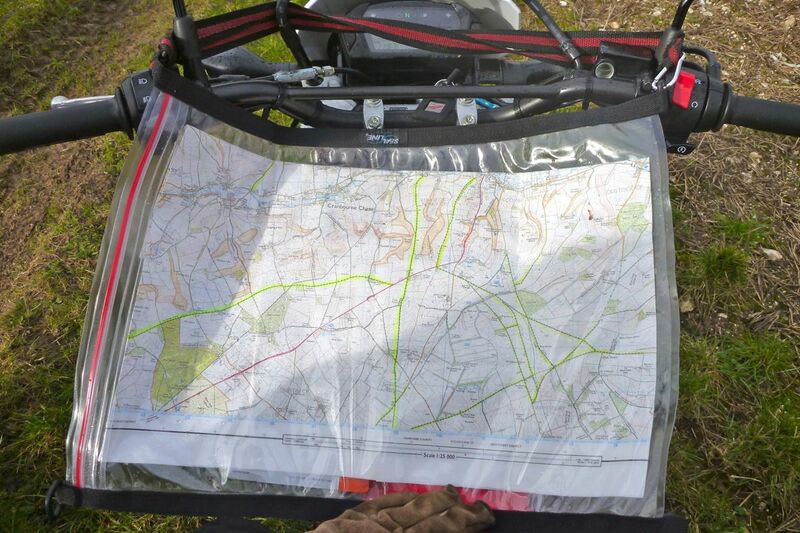 Yes they’re big to carry on a bike and may well be available as a tablet app, but give me a paper map any day for getting the big picture. I barely use the additional guidebook-like recreational info you get in a Benchmark but it’s good to know it’s there. 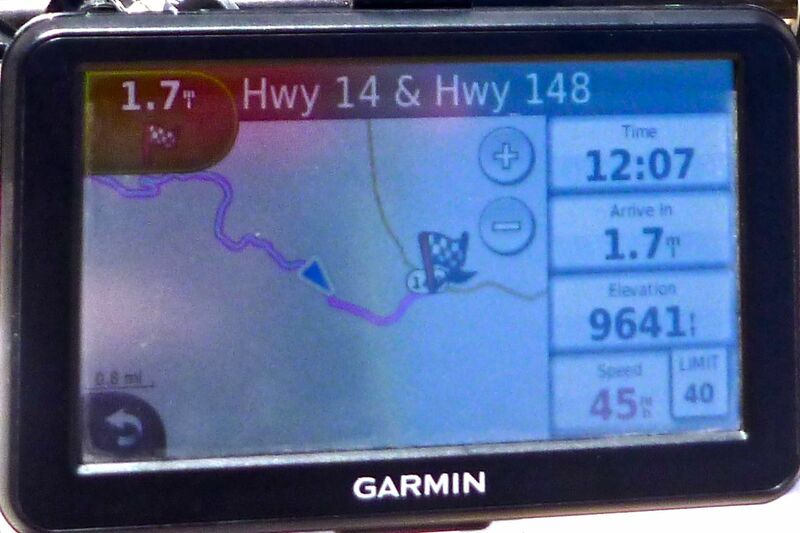 As with all paper maps, dirt road accuracy got a bit mushy at times, and here I found the US-sourced Garmin satnav filled in the gaps. And then when the satnav was wanting, just like a proper map I could read a long-lat easily off my Garmin 62 against the Benchmark’s incremental long-lat grid (above) to find exactly where I was. Verdict: I’ve tried Delormes but Benchmarks are to the US what OS maps are to the UK. Double Take mirrors – $100 pair! A mate had these in Morocco last year and I admit I fell for the hype – or wanted to see if they lived up to it. 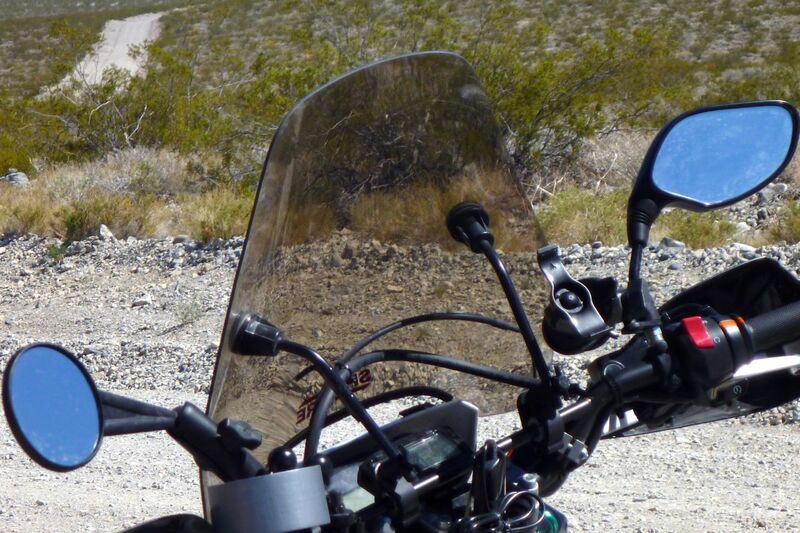 At over $100 a pair (iirc) the RAM ball-mounted DT mirrors provided infinite positioning and crash-proof toughness. I took one and left the OE Honda mirror on the nearside (on the right side in the picture, left) but soon wished I’d either kept both Hondas or ran them the other way round. For seeing what’s behind you the OE Honda was a better mirror – bigger (wider), clearer and immune to vibration or movement. That was until my single, low-speed fall on the right side when the Honda glass shattered in the otherwise undamaged plastic housing. Honda dealers at the time only sold the whole mirror assembly which had to be ordered. 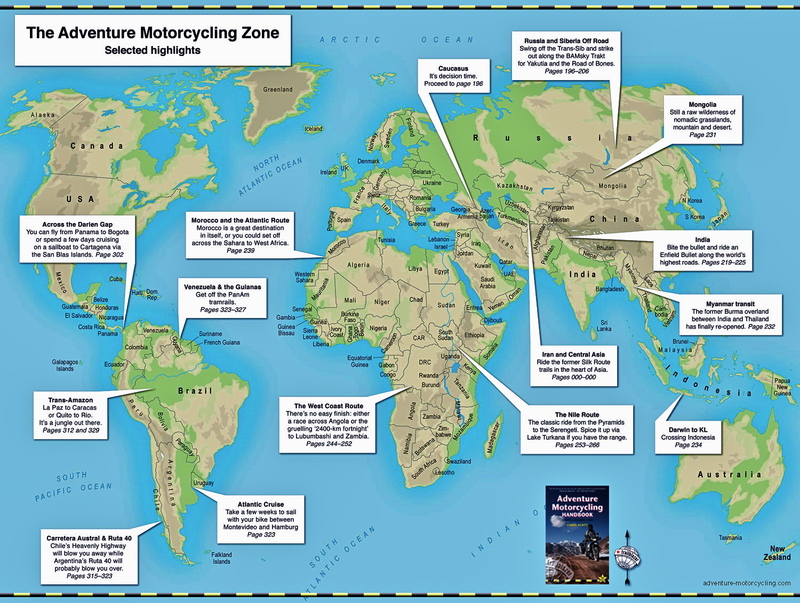 Perhaps they’re suited to more aggressive off-roading where falls are more frequent, but where you probably want mirrors to get to your riding location. Here a Double Take or the like soon pays for itself, although I found at road speeds it blurred too much to be reliable and moved around on the dirt or in strong headwinds, no matter how hard I clamped it. And with that nifty mirror-base RAM mounts they are rather nickable; RAM’s theft-proof clamp is not the slickest design. Verdict: built for crashing, but on the Honda less good for seeing. I’ve had 4×4 turbo-diesel engines ‘chipped’ through I never knew exactly what was being done – it seemed to be one unprogrammable map and the sort of performance chasing meddling that doesn’t interest me that much. 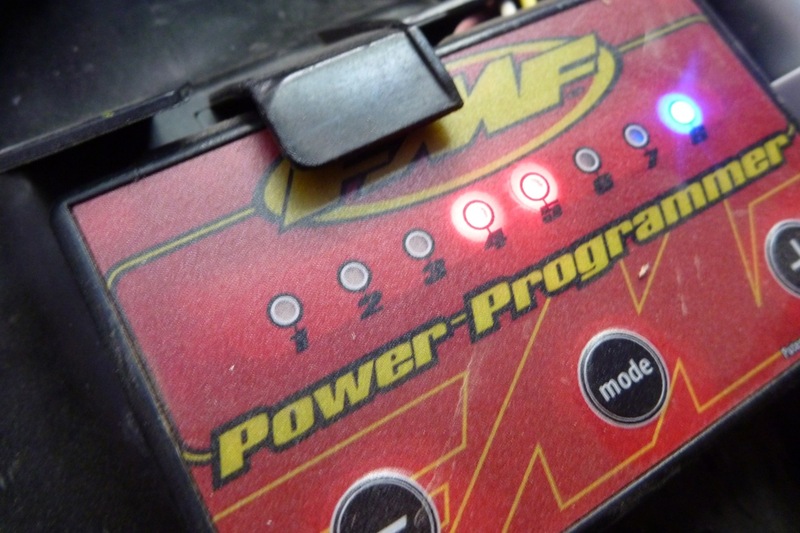 For petrol engines EJK’s fuel controller is a bit more sophisticated: an ‘electronic jet kit’ enabling you to increase fuel delivery (richen the mixture) as you experiment with performance enhancement. Short version: at $200 a useful bit of kit to experiment with or optimise the mixture; long version here. Verdict: another good reason to bid adios to carbs. 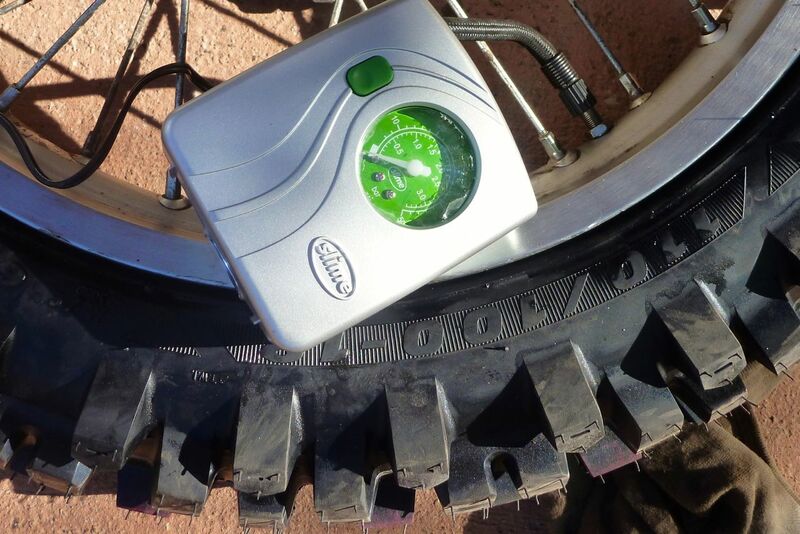 The bike came with this set up the suitably calibrated EJK (above) and holes in the airbox, but one day’s dirt riding convinced me the Q was not at all Quiet and would have driven me nuts on the long road. 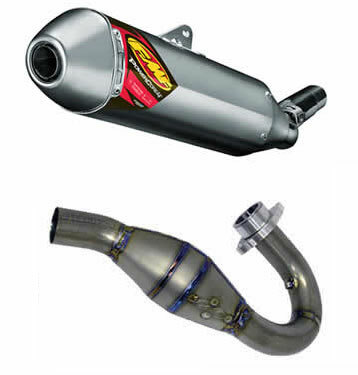 Even at double the weight I was happy to refit the weighty OE cat silencer and flogged the FMF set up. Verdict: way too noisy and can’t say I noticed any significant power loss once removed. 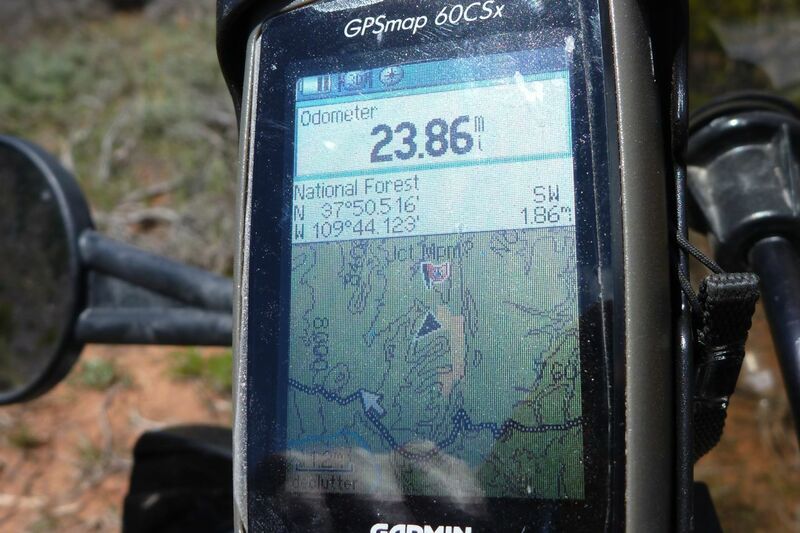 I used the bulkier GPSMap 72 for years to log tracks for my off-roading guidebooks until it started playing up. I was happy to replace it with the more compact and popular 60 series using the similarly intuitive interface. 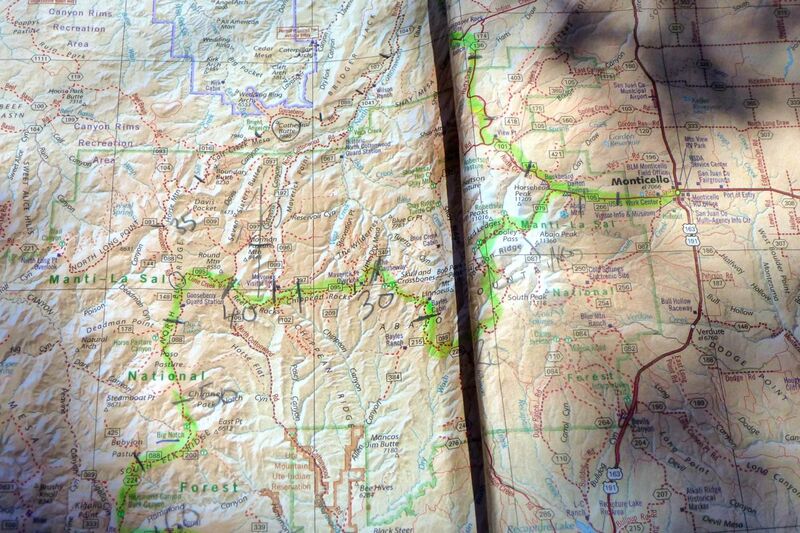 This one had Utah topo maps on it and took the UTBDR tracklog without any undue gnashing of teeth. And a RAM cradle mount performed securely without vibration issues. Verdict: CSx not made any more but still preferable to touch screen Montana/Oregons. I hoped that a US-sourced Nuvi would have maps which featured the countless miles of unsealed roads in the western US, and so it did. When the Benchmark atlases got a bit vague the Nuvi led me out of the mountains, providing it was set up right and you took the suggested directions with a pinch of salt. Don’t know if it was my basic unit but I found that the full range of tracks around me would only display once a ‘Go to’ was set (a memory saving feature perhaps?). It meant I couldn’t scroll/zoom out to see the possibilities around me without a ‘go to’. Also, I was too lazy to address what I knew would be problem with vibration. Last year using a similar unit in Morocco I was smart enough to lay it on foam on the tank, this time with a cobbled together Garmin/RAM set up the vibration at higher revs caused it to cut out. I’ve since modified my home-made mount to incorporate a foam sandwich (above left) that may work better with future moto Nuvi-ing. Used Nuvis are cheap and easy to find on ebay; Garmin’s moto-focussed waterproof Zumo is not. You can buy waterproof pouches for a Nuvi to fit your bike. Verdict: as long as it has worthwhile mapping, a used Nuvi is a good value nav aid. I soon found that trying to update this website on the road from an iPad was frustrating, even with an accessory keyboard; WordPress have not got to the bottom of it. Luckily craigslist Phoenix had several used Macbook Airs within arm’s each. What a relief to get back to Mac’s laptop platform at about the same size and barely twice the weight of an iPad. Verdict: a tablet to read but a laptop to write and edit. Nearly six years, many trips and a couple of dents later, I’m writing this in New Zealand on the same well-used airbook. What a brilliant machine! I’m not so keen on tank bags but can’t fit all my essentials in my jacket so a backpack like the R30 takes the laptop and other valuables, sandwiches and quick access day items. Too heavy a backpack accelerates backside pain but the R30 rested on the Watershed when seated so took the weight off my shoulders. Like a lot of Kriega stuff there’s some very clever but over-complex strap adjustment system that I never investigated; for me it fitted well enough out of the box. It includes a double clip joining the shoulder straps across the chest which along with the grippy mesh on the back helps keep it in place. On the back are cinch-down straps to stop a loose bag flapping. But when unclipped the chest clip arrangement doesn’t hang naturally off the shoulders when walking and who wants to walk around clipped in as if you’re ready to make a parachute jump. On the move I can’t say I ever noticed it which is the point and the capacity is expandable enough for all my needs; if not camping you could probably get a superlight touring load all in there. Best thing about it was a simple, zip-free roll-top closure which, unlike around-the-top zips, won’t matter too much if you forget to do it up – opened zips see stuff fall out. The small outside pockets do feature water-resistant zips which are a bit stiff to use, but then zips do need cleaning from time to time. The R30 has a velcroed-in, removable waterproof liner which I hear is up to the job and easy to replace once it isn’t. Or just use your own dry bags. 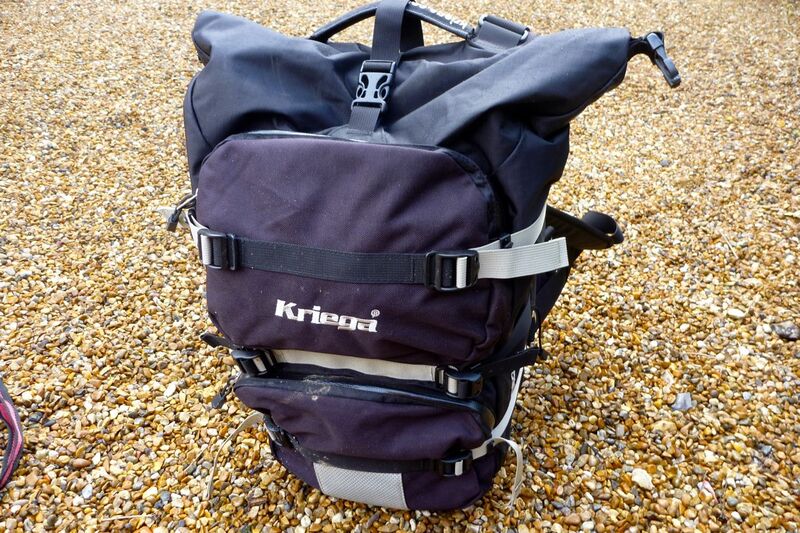 The chunky top handle is another good feature, the reflectives are probably useful and the quality of construction is what you’ve come to expect rom Kriega. Verdict: expensive for a backpack but actually designed for biking not hiking. I figured this was a compact way to inexpensively increase fuel range and rated fuel bags as such in the book: rolled up out of the way when not needed; handy when they are. That may be true for the odd occasion when you need extra fuel, but I found a fuel bag was less well suited to near daily use on a motorcycle. The rot set in when the o-ring cap seal fell out and blew away unnoticed at a fill up in Vegas – didn’t notice that until that evening when everything reeked of 85 octane. A day or two later I picked up a replacement o-ring for a backstreet garage, but had gone off the bag by then. 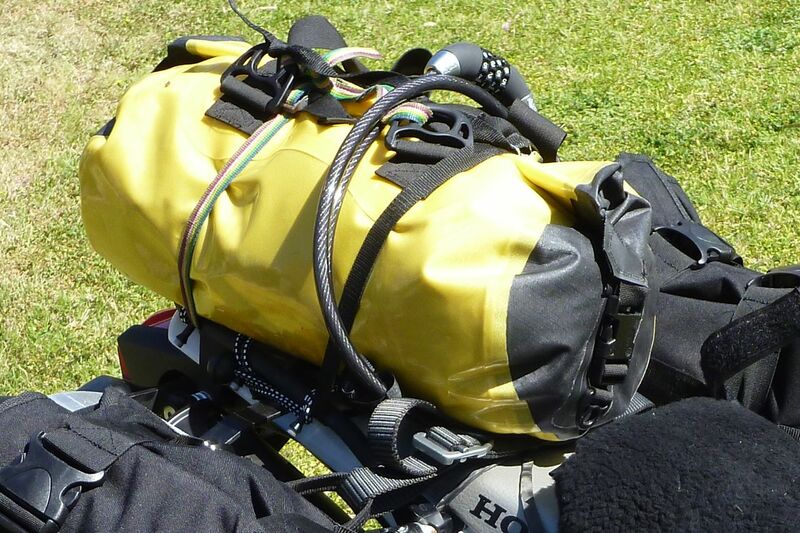 The other pain on a bike is securing a wobbly bag of fuel reliably, securely and without faffing. Sure, the tough plastic LQ has holes on every corner but at a fuel stop you have to release the bag, prop it up, fill it up, cap it and then secure the load to the bike. If I had stuck with it I’d have found a good method, but these sorts of repetitive tasks need to be foolproof for the day you rush it and make a mistake. 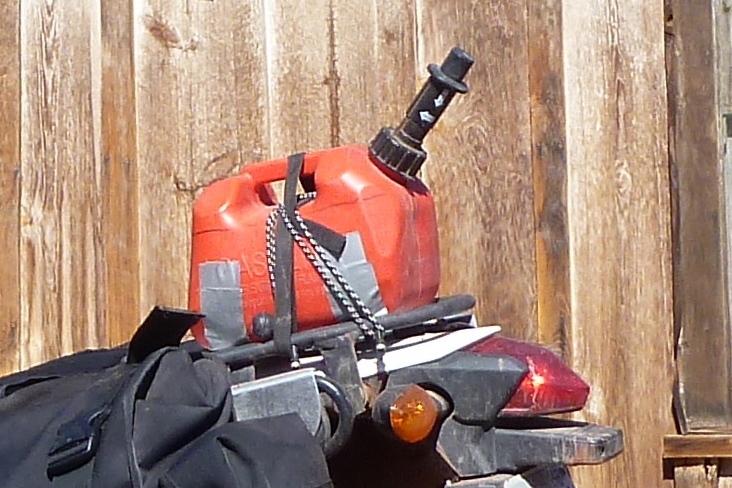 Like scores before me, I found a red plastic $10 one-gallon can strapped to the tail rack better for near daily use. To fill up simply undo the cap, like an auxiliary fuel tank; to decant into the bike tank undo the straps, pour in and refit. A bigger tank in a worthwhile size was not available for the CRF-L at the time. Note; the fuel bag I used was not the same as the 7L item which Zen sell in the UK. Theirs is an older, bigger and superior model with an integrated pouring spout inside the cap and a handle. Verdict: in practise not so convenient for regular use. 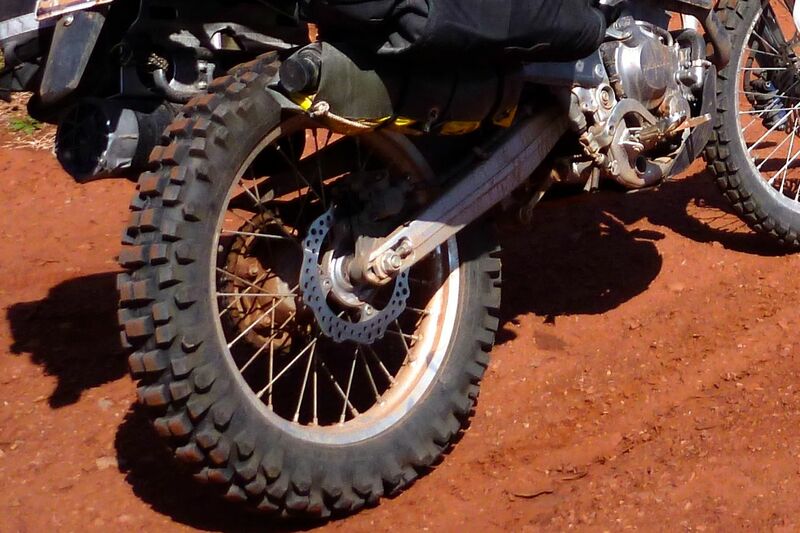 Amazingly the CRF-L’s OE rear IRC tyre was finished in 3000 miles – a record for me, and on a 18-horse 250, too! I found the meaty-knobbed Maxxis (like an MT21 or D606) was easy to fit with short levers and some WD40 lube, didn’t play up on the highway (bike not heavy or powerful enough to stress and flex the knobs) while on the dry and rocky dirt I rode at road pressures it did the business and I’m sure would have outlasted the IRC. Verdict: performed as well as better known brands; a pair goes for <£100 on ebay. I’ve had this camera for a couple of years now and use it almost every day. When it was playing up recently I looked around but newer models in the FT range all had compromises (smaller battery, less megapixels, unnecessary gimmicks like GPS, expensive) as did other brands. So I got another old FT2 off ebay for £60 but which time my original camera had fixed itself. What I like about Lumixes is they commonly feature wide-angle lenses (28mm or less) over excessive zooms. An FT2 camera is also shockproof and waterproof to a few metres so rain or sand won’t bother it and it’s robust enough to survive ‘carefree’ treatment. Yes, the enclosed lens is tiny and the zoom is limited, but slipped into my jacket’s chest pocket and hung around my neck on a cord, it’s easy to use while riding. And just occasionally the auto exposure captures the scene as well as any DSLR. At other times – especially on full optical zoom, the quality drops off; better to shoot wide at max resolution and crop later (I always disable digital zoom). With landscapes, a trick I use with these types of cameras all the time is half press the shutter and expose off the sky, then lower the camera, compose and click. The resultant ‘tricking’ into under exposure often gives a richer result (or one that can be more easily edited). I didn’t film on this trip, but have done a lot elsewhere and the results are up to youtubing. I even sold my annoying GoPro a while back and am now happy to use the FT2 for movie making. 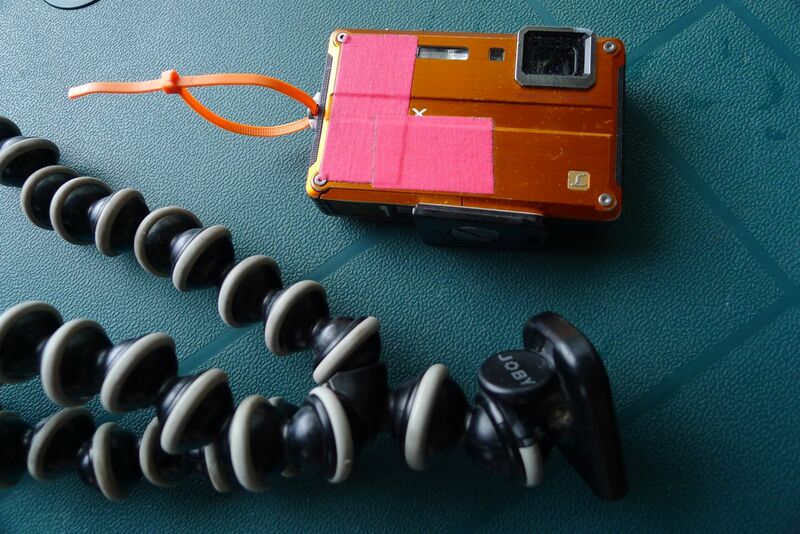 The tougher, DSLR-sized Gorillapod also works well as a steady tripod or clamp. Verdict: until it wears out or breaks up, can’t think of a better P&S camera. 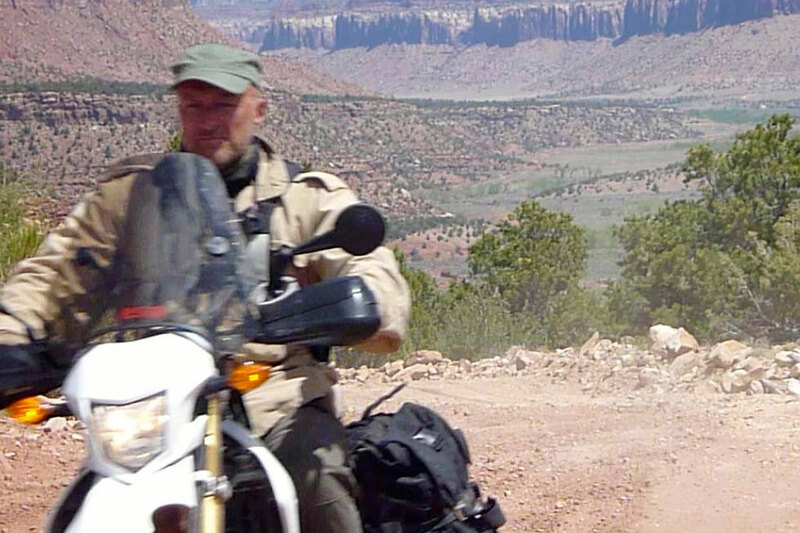 On this trip to save weight I bought a lid once in the US (see Bell), wore my heavy leather trousers and old Altberg boots on the plane and brought my Aerostich Kanetsu electric vest to make up for my regular ‘M65’ desert jacket; no armour, Gore-tex, mesh or reflectives – just light, quick drying and with enough big pockets to make up for not being a Darien. In the event of heavy rain I had my old Rukka one-piece suit, but never needed it. For gloves I has my similarly ancient unlined Aerostich Deerskins (sadly MIA) and a pair of Armr Moto WXP8 gloves for cold days. Apart from the Rukka, all got used all or some of the time. Temperature-wise this trip was quite extreme but I felt protected enough to be comfortable, while never feeling over-laden with clobber, as you can do with moto gear. Verdict: for the local conditions, the best set up I’ve ridden in. 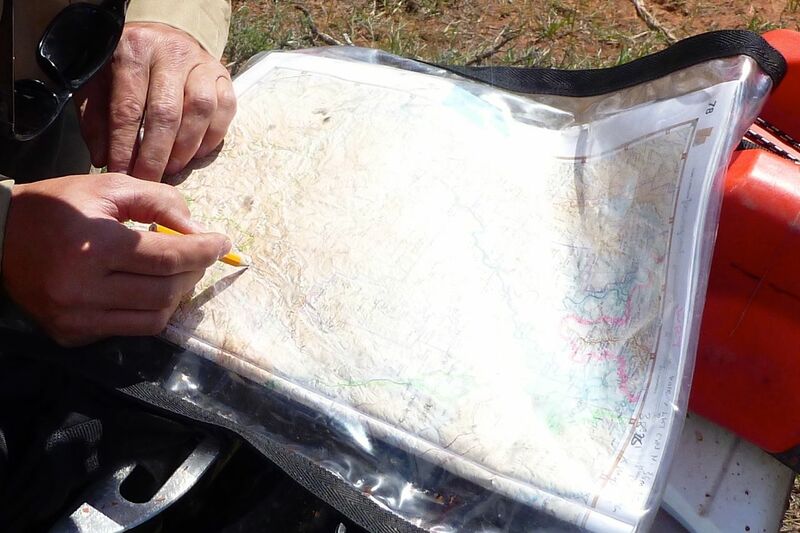 I normally use this for sea kayaking or packrafting, the zip-lock seal keeps maps and other bits dry and the big size gives you the all-important big picture without the need to open up and refold a map too often as the crashing surf closes in. In the Southwest the map case took a folded back Benchmark with room to spare and stopped the pages flapping in the wind. I found a neat way of holding the maps case down was stretching a thin loop on inner tube from one side of the engine to the other (right). 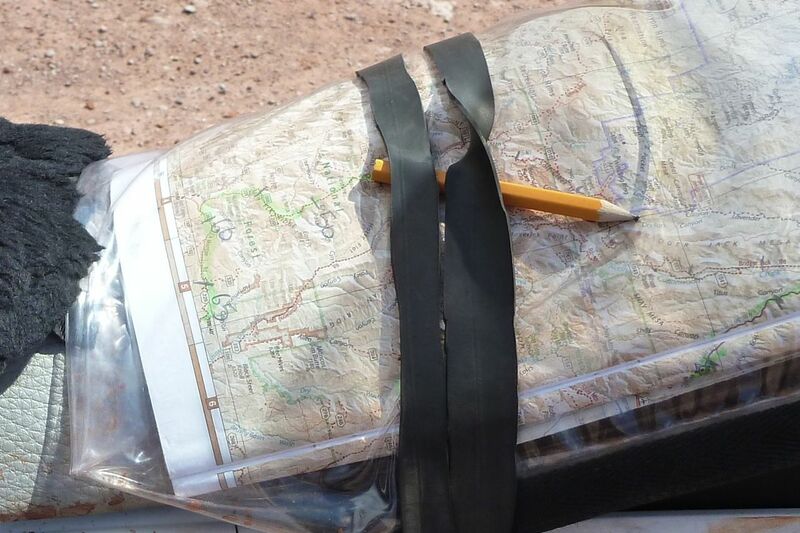 Note: they also make roll-top map cases, not as reliably waterproof as the zip lock version. Verdict: moto or boto, great bit of kit. Can’t say the luridly green Slime fluid stopped any punctures on my ride, but for ten bucks it was worth the squirt. Also on the shelf in Walmart was a Slime-branded 12-volt compressor (right) also for a tenner and with a pressure gauge too and the ever useful flashing light. More compact and lighter than my Cycle Pump, I actually used the Slimepump a few times and it performed fine. Verdict: well worth $20 for peace of mind. 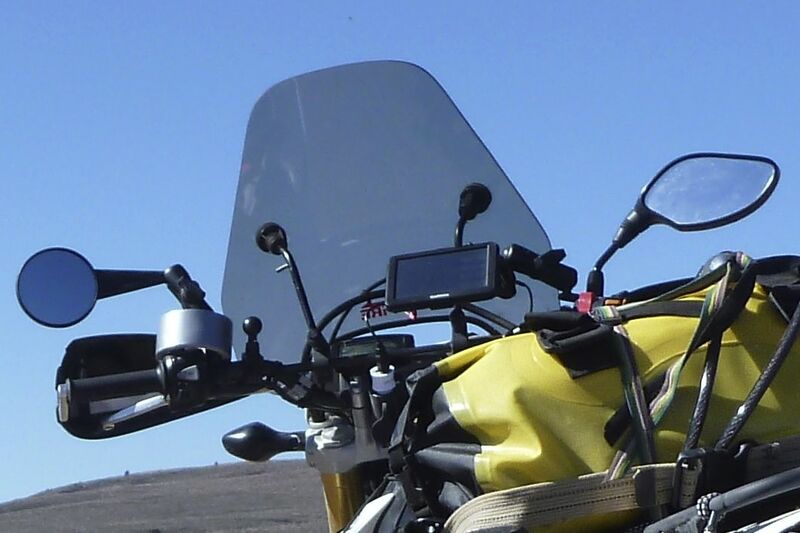 Just what was wanted for the CRF; a small, inexpensive, one-size-fits-most screen to keep the wind and rain off. Mounting is a bit rudimentary but adds up to a quick, tool-free way of temporarily removing the screen while leaving the bar mounts in place, something I was slow to catch on to for dirt day rides when the screen was not needed. 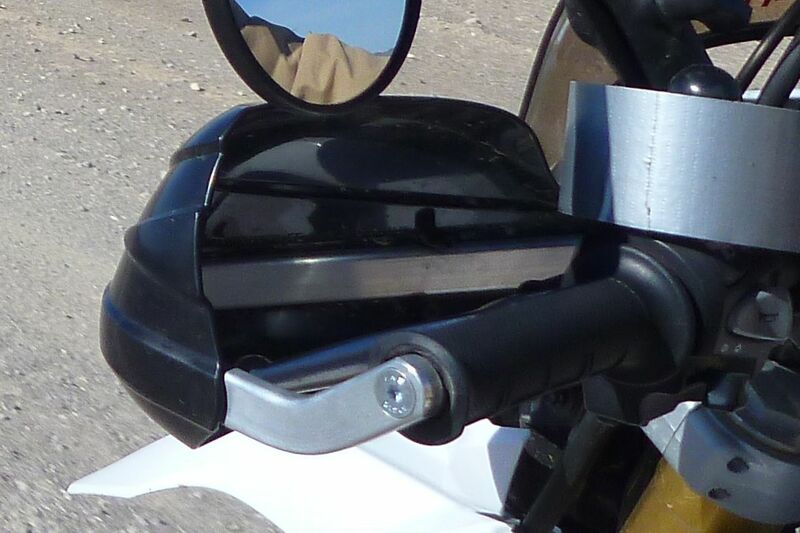 With only two mounting rods (no triangulation) high-speed runs into headwinds or rough tracks caused the screen to inch back – this could have been fixed by anchoring the base of the screen to the headlamp cowling. It seemed hard to get a tight fit on the screw down screen mount lugs too, but meddling with spacers or rubber shims would fix this. Verdict: Great value, simple fitting and effective. 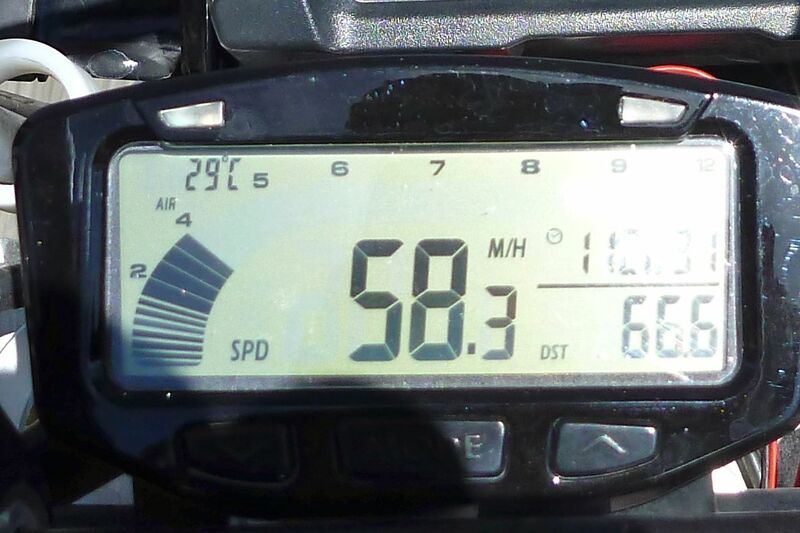 A great gadget for a travel bike like the CRF-: with limited instrumentation. Click the link for full review. 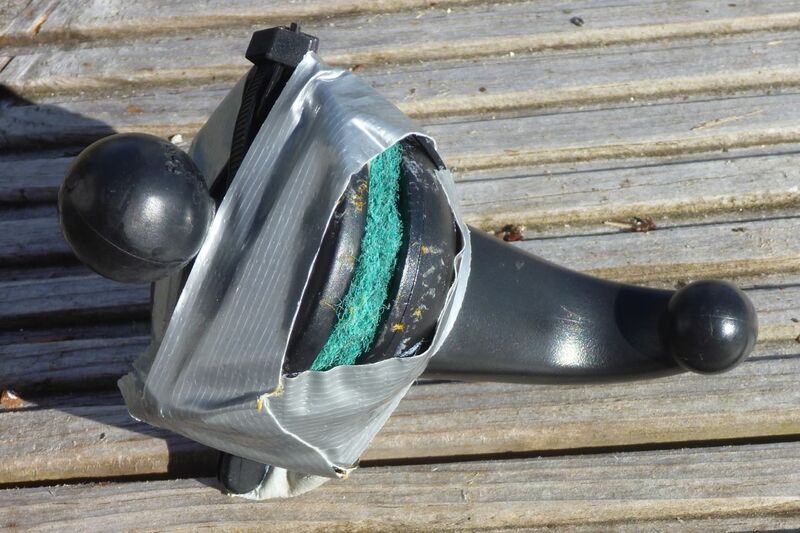 Another kayaking item that works well on bikes. 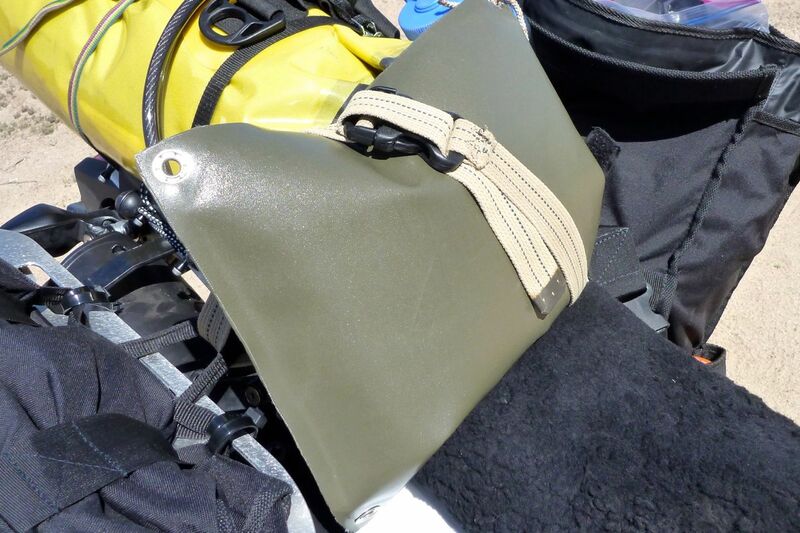 Watershed dry bags use a tough fabric, but unlike your average roll-top bag, they feature a chunky ziplock-like seal that makes the bag immersion proof. At about 20 litres the Chattooga model is compact but big enough to take my infrequently used tent, sleeping bag, sleeping mat and a spare pair of gloves. It didn’t happen on this trip but it’s good to know in heavy rain you need not worry at all about your camping gear getting wet until you take it out. For smooth closure the zip seal can use a bit of WD or 303 once in a while. 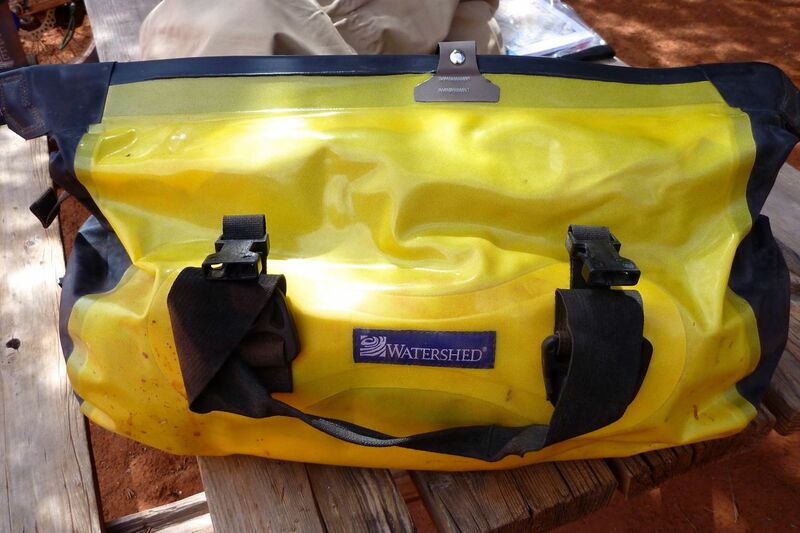 Verdict: Watershed when it absolutely positively has to be kept dry. 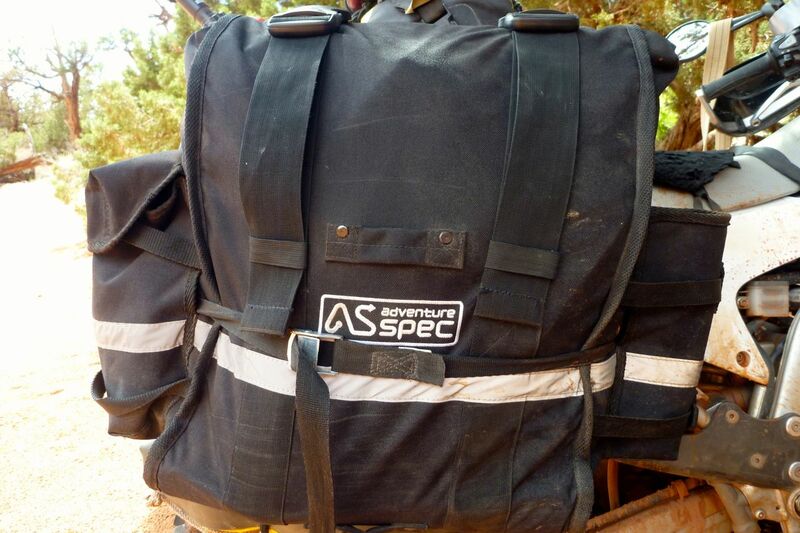 This entry was posted in Adventure Motorcycling Gear Reviews, AMH News, Project Bikes, Project: Honda CRF250L and tagged adventure spec magadan bag, Aerostich wool seat pad, Alpha Three tail rack CRF250L, Barkbuster Storm handguards review, Bell Mag 9 helmet review, Benchmark atlases, Double Take mirror review, EJK fuel controller, FMF Q4 pipe + Megabomb header, Garmin GPS 60CSx, Garmin Nuvi LM50 review, Honda CRF250L, Kriega R30 backpack review, Liquid Containment 5L fuel bag review, Maxxis IT Desert tyre, Panasonic Lumix FT2 camera review, SealLine XL map case, Slime, Slipstreamer Spitfire windshield review, Watershed Chattooga dry bag review. Bookmark the permalink.